* Eastern Hemlock trees are one of the most common trees in Michigan, and they can be found in the WEMU listening area. The MDNR is requesting that citizens become familiar with the signs of hemlock woolly adelgid damage and report signs of damage immediately. 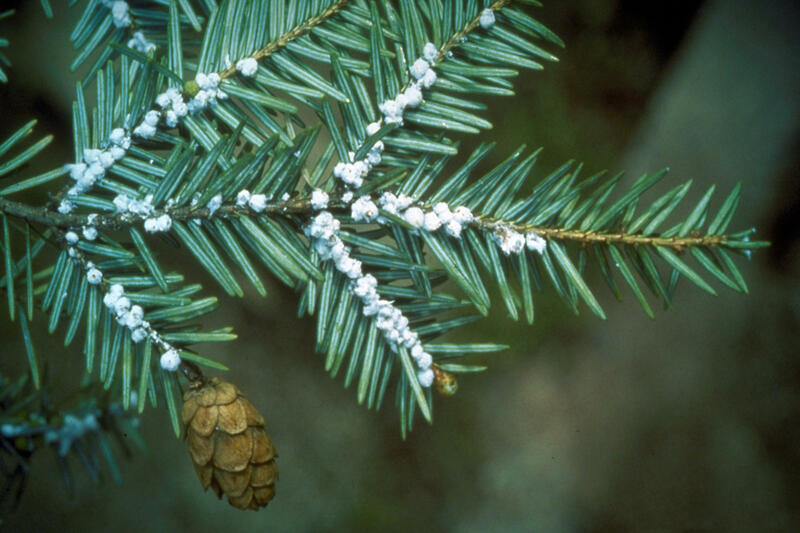 * The hemlock woolly adelgid (HWA), a tiny aphid-like insect native to Japan and one of the most damaging invasive forest pests in eastern North America, has caused high mortality among eastern hemlock, making permanent changes to forests in many eastern states. The adelgid has reached Michigan several times, but early detection has led to eradication. * Roger Mech, Forest Health Monitoring Program Manager, says that detection by non-professionals has been critical in stopping this invasive pest, and infested trees can be treated with pesticides or soaps before the disease spreads. Anytime a governmental unit authorizes lethal measures as a way to control animal population, there are those in the human population that get upset. Such is the case of the Michigan Department of Natural Resources management plan for Mute Swans in Michigan. On last week’s “Issues of the Environment,” David Fair discussed the state action plan with Holly Vaughn of the Michigan DNR. This week, he talks with John Griffin, Director of Urban Wildlife at The Humane Society of the United States, for an alternative viewpoint.